A gluten-free stuffing recipe is crucial for those who need avoid gluten due to allergies or sensitivities. 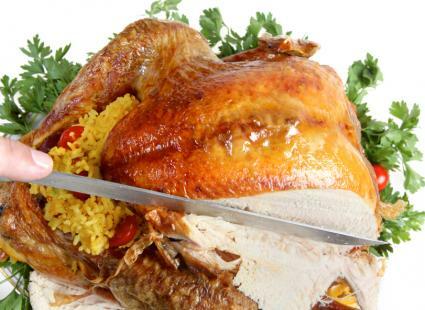 A turkey stuffed with a standard stuffing is rendered inedible by anyone suffering from Celiac or another gluten intolerance, which makes finding an alternative so important. This stuffing recipe uses rice in place of a traditional bread filling. The result is good enough to eat for everyday dinners or to stuff your bird for your next holiday meal. This recipe makes approximately three cups of stuffing. Leave at least two hours for preparing it before you cook your bird. Heat the chicken broth in a medium-sized saucepan until boiling. Add the rice, reduce the heat to low, and cover. Cook the rice for 40 to 45 minutes or until tender. Set the rice aside in a bowl. Heat the butter in a saute pan until melted. Add the onion, celery, pecans and fresh herbs. Saute on high heat until the onion is translucent. Pour the onion mixture over the rice and mix well. This recipe does well stuffed inside a traditional turkey, but it makes a wonderful side dish on its own. Serve with other more traditional sides such as mashed potatoes and gravy for a delicious stuffing alternative. If desired, add diced red peppers to the mix as well. Other types of long-grain rice can be used in place of wild rice. Avoid sticky or short-grained rice, which may give a gummy texture to the dish. Leaving out a key dish in a traditional family meal can feel unsettling. Try substituting your old stuffing recipe for this one made of rice, and enjoy the entire meal once more.